LONGWOOD, FL – January 22, 2019 – With the start of the new year, Waste Pro is furthering its commitment to rewarding safety-minded employees. 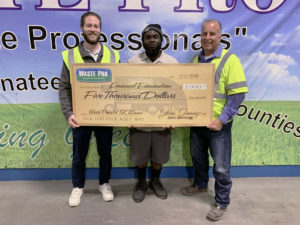 Two helpers in Waste Pro’s Southwest Florida region have become the first recipients of the $5,000 Helper Safety Performance Bonus, a three-year performance bonus program launched in January 2016. The first recipient of the award was Emanuel Edmondson, a helper in Waste Pro’s Bradenton/Sarasota division. Waste Pro President Sean Jennings, who previously served as Sarasota Division Manager, worked closely with Edmondson and saw first-hand Edmondson’s dedication to his job. To receive the bonus, helpers must be employed full-time; go three years with no unscheduled absences, customer complaints, property or vehicle damage, rule violations, or driver-caused breakdown; and must maintain a clean truck. In the Fort Myers division, helper Guins Menelus was named the second bonus recipient. A 12-year veteran of the division, he “has been a rock-steady member of our team,” said Division Manager Bill Jones.